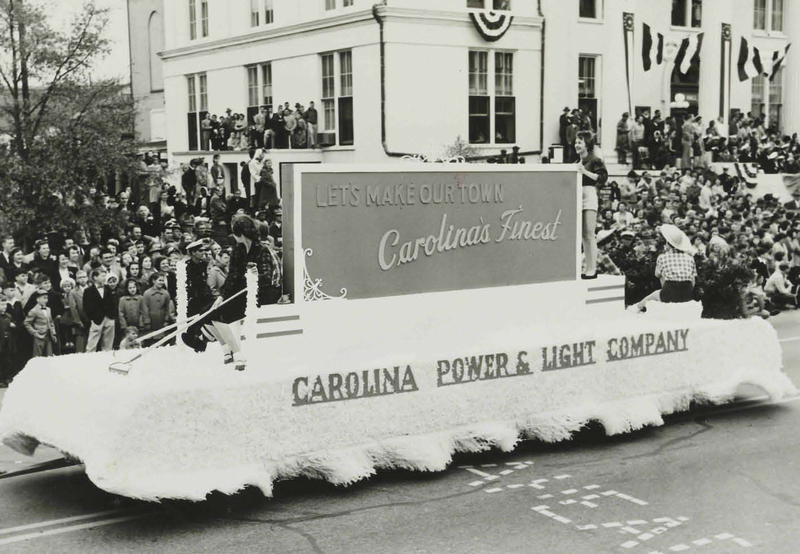 From 1952 to 1959 the Carolina Power and Light Company (CP&L) hosted a “Finer Carolina” contest, in which cities and towns in the CP&L service area vied for cash awards by engaging in community improvements. From a history of CP&L I learned that over the seven years the competition was held 4,600 projects were undertaken, including those aimed at “beautifying residential areas, improving cultural opportunities, upgrading municipal facilities, stimulating business, and attracting new industry”. 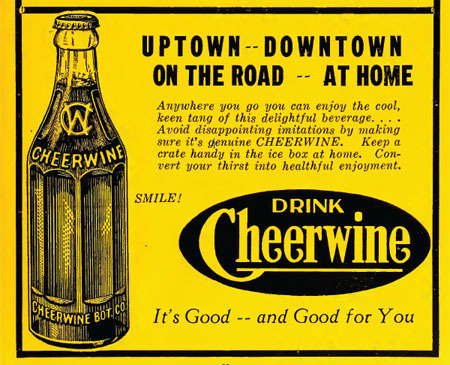 Some materials on DigitalNC are evidence of the participation of North Carolina’s communities, such as this 1954 scrapbook from the town of Burgaw documenting their Finer Carolina activities. The year 1954 was a banner year for the contest, according to a front-page article in the February 25, 1954 issue of the Raeford News-Journal. During this year there were 160 entries, including Raeford, N.C., competing for $6,750 in prizes. The Architectural History of Randolph County, N.C., also mentions the Finer Carolina contest, as the city of Asheboro took home the winning prize in 1954, as well as 1955, 1956, and 1958. But perhaps these awards weren’t such a boon for Asheboro after all, as the history describes the city’s improvement projects as resulting in “the nearly total destruction of the city’s nineteenth-century heritage”. Items featured in this post are shared on DigitalNC by Pender County Public Library and Randolph County Public Library. 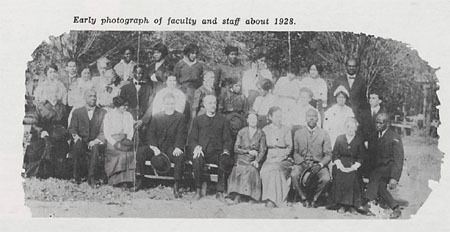 Happy birthday to Saint Augustine’s College (now Saint Augustine’s University) in Raleigh, which is celebrating the 145th anniversary of its founding with full program of Founder’s Week activities. A large collection of student yearbooks from Saint Augustine’s are available on DigitalNC, and we’ve recently added materials from the vertical files at the Harrison Library in Raleigh, which include many documents related to Saint Augustine’s College, including programs, pamphlets, and brochures. 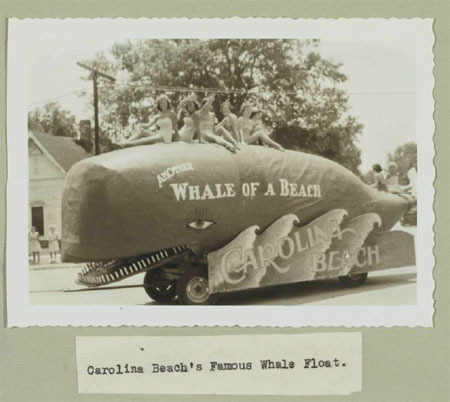 We’ve just finished digitizing a dozen scrapbooks from the Pender County Public Library documenting the diverse activities of the Burgaw Jaycees, primarily in the 1950s. The scrapbooks contain photographs, newspaper clippings, and a few documents related to the work of the Jaycees. Whenever we start a new digitization project in the North Carolina Digital Heritage Center, we like to work with materials that are in the best possible condition, in order to preserve the often fragile original items and to get the highest quality image we can. How, then, did we end up with this? This paper is in the Local History & Genealogy section of the Braswell Memorial Library (Rocky Mount, N.C.). 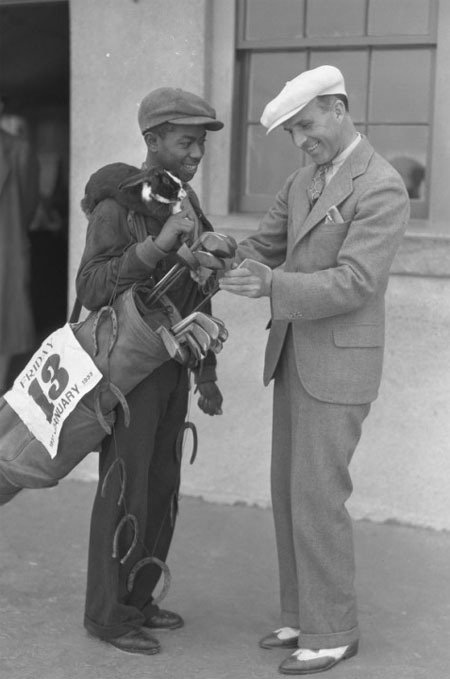 This Friday the 13th you’d be hard pressed to do more to ward off ill luck than this golfer, who took a string of horseshoes and not just a rabbit’s foot but an actual live rabbit out on the course with him. The photo, taken January 13th, 1933, is from the great collection held by the Tufts Archives (Pinehurst, N.C.). Hopefully the flu shot you received this winter was a little less dramatic than the immunization — complete with targets on each arm — administered to Cpl. Paul “Tiny” Evensen at the Overseas Replacement Depot in Greensboro in 1944. From The ORD News, September 14, 1944. I like how they describe the taste as a “cool, keen tang.” And they should definitely bring back that “Good for You” slogan. If today’s headlines have you down, trying reading old news instead. 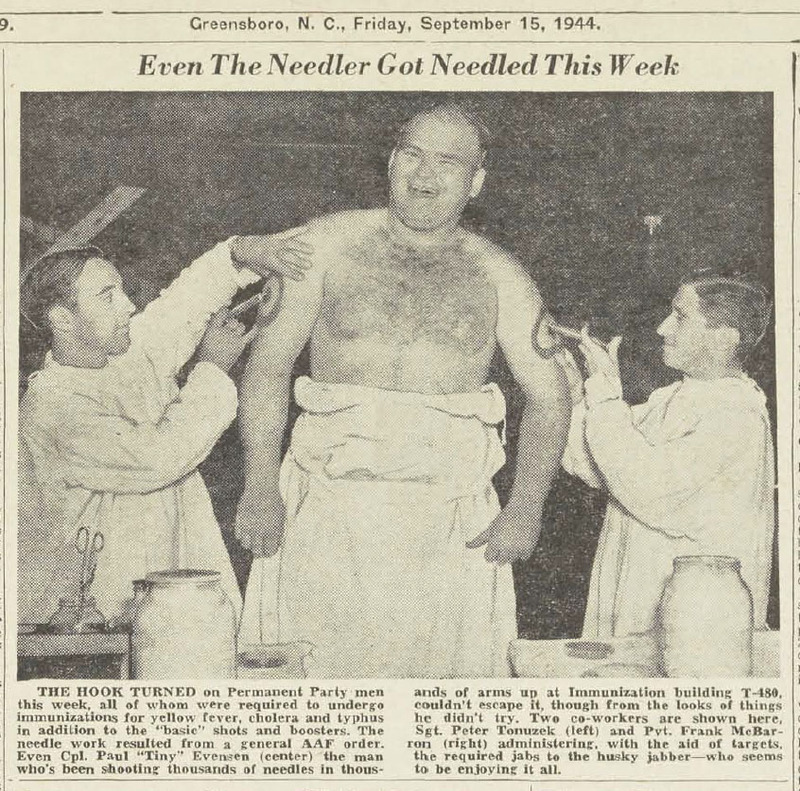 The NC Digital Heritage Center makes its first foray into Twitter with @ncnewspapers, where we’ll be tweeting a historic headline every day from that day in history. The stories we feature will span the full range of North Carolina history from the 19th and 20th centuries. It’s a fun way to peek into our state’s past, and a great introduction to the wealth of material available in these historic papers. 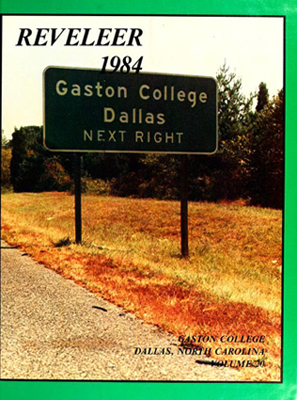 Student yearbooks from Gaston College are now available on DigitalNC. There are twenty yearbooks spanning from 1966 to 1985. Gaston College is one of two community colleges in North Carolina that doesn’t have the word ‘community’ in its name (the other is the College of the Albemarle). More than 150 issues of the Mecklenburg Jeffersonian, a weekly paper published in Charlotte in the 1840s, are now available as part of the North Carolina Newspapers collection. The Jeffersonian was a staunchly Democratic paper, and a strong supporter of North Carolina native James K. Polk in his successful bid for the Presidency in 1844. 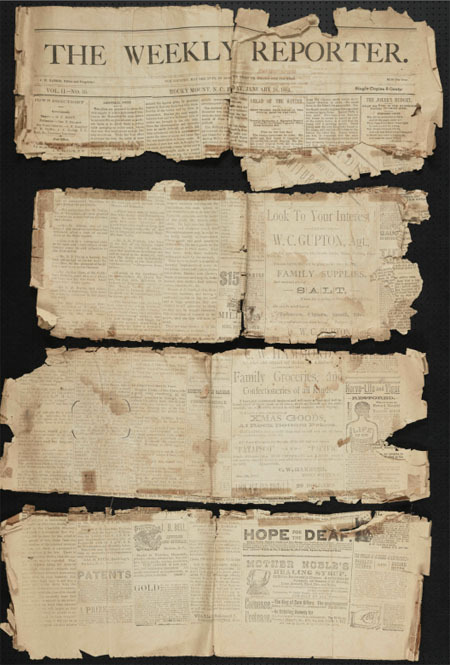 In addition to the editorials and long excerpts from political speeches, the Jeffersonian includes the myriad notices, advertisements, and general miscellany that make these old papers such fascinating and valuable resources. I especially like the distinctly Charlottean logo, featuring a flag bearing the date of the Mecklenburg Declaration of Independence and a beehive. The Jeffersonian was nominated for digitization by Charlotte Mecklenburg Library.